by Kaleem Aftab. The National, June 2, 2011. Terrence Malick in 1974. His early work, which was acclaimed for its European sensibility, was followed by two decades in which he made nothing. However, his productivity seems to be picking up. 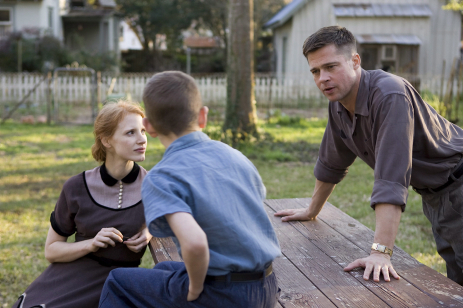 Jessica Chastain and Brad Pitt in The Tree of Life, which won the Palme d'Or at Cannes this year. 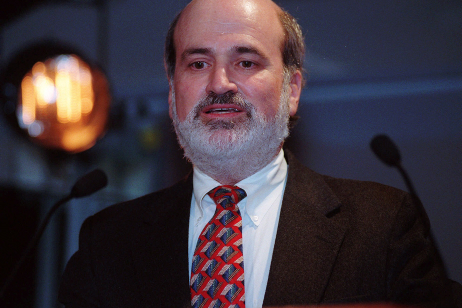 Although he is famous for not talking to the media - or festival audiences - the director Terrence Malick can be understood to some extent through his work. There was no surprise when Terrence Malick failed to go on stage to pick up the Palme d’Or for The Tree of Life at the Cannes Film Festival. He left that honour to the film’s producers, Bill Pohlad and Dede Gardener. After all, apart from two interviews to promote Badlands in 1973, with the scholarly European journals Cahiers du Cinema and Sight and Sound, the director has steadfastly shunned media attention. He is that rare beast, someone happy to let his work speak for ­itself. Nonetheless it would be more accurate to call the American director elusive than reclusive. Although he did not walk the red carpet at Cannes, nor attend the press conference nor give interviews, he did sneak into the world premiere of The Tree of Life and hugged the stars Brad Pitt and Jessica Chastain during the standing ovation the film received. Part of Malik’s allure is the mysteriousness of both the man himself and his art. He lives in Austin, Texas, with his third wife Alexandra Wallace. His first wife, Jill Jakes, was an assistant to the director Arthur Penn, and his second marriage, to a French citizen, Michelle Gleason, lasted much longer, spanning the time after he made Days of Heaven in 1978 to the mid-1990s, taking in most of his two-decade filmmaking hiatus. The good news is that from those two interviews and in a piece by the Easy Riders, Raging Bulls author Peter Biskind for Vanity Fair, much information about the life of Malick can be gleaned. He was born on November 30, 1943, in Ottawa, Illinois (although he told Cahiers du Cinema that he was born in Waco, Texas), and grew up in Austin and Oklahoma. His father, Emil, an Assyrian-Christian who came to America from Lebanon, was a geologist who worked in the petroleum industry. His mother, Irene, grew up on a farm near Chicago. Terrence was the eldest of three sons, a family structure mirrored in The Tree of Life, which also has scenes shot in Waco and Austin. Malick went to school at St Stephen’s Episcopal High School in Austin, and religion has been a major part of both his life and his work. At school his interest in drama saw him appear in plays and he was purportedly a fine American footballer. He attended Harvard University where he read philosophy and graduated in 1965. After winning a Rhodes scholarship he had an unsuccessful stint at Oxford University and failed to complete his doctorate. He reportedly had a dispute with his tutor over the subject of his thesis. The desire to do things his way was something that would suit him well in the director’s chair, although some actors have found his way of working infuriating, for example, his insistence on repeating dialogue and shots. It has been widely stated that Malick and the Days of Heaven star Richard Gere had numerous run-ins on set. After leaving Oxford he worked as a freelance contributor to The New Yorker, where he wrote obituaries for Martin Luther King Jr and Robert Kennedy. He went to Bolivia in 1967 to write an article about the trial of the French communist intellectual Regis Debray, an associate of Che Guevara, the day before Guevara was captured and killed in the jungle. Malick stayed for four months. Intriguingly, Malick was attached to direct Che, starring Benicio Del Toro, but left the project in 1994 to make The New World when the budget could not be raised. On his return to the US he taught philosophy at Massachusetts Institute of Technology for a year and translated Heidegger’s Vom Wessen des Grundes as The Edge of Reason. His contemporaries there included David Lynch and Lanton Mills, while the short film he made featured Warren Oates and Harry Dean Stanton. After graduation, he became a peripheral figure in the New Hollywood Cinema clan that Biskind portrayed in his book Easy Riders, Raging Bulls. However, work flooded in. Malick wrote a draft of Dirty Harry and penned Jack Nicolson’s forgotten directorial debut Drive, He Said. His big break, though, was his own directing debut Badlands, starring Martin Sheen and Sissy Spacek. Loosely based on the actual murder spree of Charles Starkweather, it is often cited alongside Arthur Penn’s Bonnie and Clyde as a seminal work in American cinema. Badlands was acclaimed for its European sensibility, a feature that became all the more apparent in his love-triangle follow-up, Days of Heaven, set in the Texas Panhandle in 1916 and again about a murderer. Death, especially of young protagonists, is an element common to all five of Malick’s films. However, the director hid away in the cutting room for two years, editing and re-editing the film and when he refused to promote it, his reputation as a reclusive genius was born. No one quite knows why it took Malick 20 more years to make another film. There were constant rumours that he was working on scripts, but it came as an enormous surprise when it was announced that Malick would direct the Second World War drama The Thin Red Line in 1998. His reputation was such that every young actor worth his salt approached him for a part, but Malick also demonstrated that reputations meant nothing to him and left much of young Adrien Brody’s performance on the cutting-room floor. The film also suffered by coming out just one month after Steven Spielberg’s much-admired war epic Saving Private Ryan. The New World (2005) was another film where Malick looked at conflicts between civilisations and differing ideals about the meaning of life. The arrival of Europeans and their clashes with native Americans chimed with his themes of science versus grace, and his preoccupation with nature, Darwinism and many of the questions that are central to philosophy. All of these facets come together in his most ambitious, elliptical and fascinating film The Tree of Life. It’s also his most autobiographical film. Personal tragedy of the kind at the heart of The Tree of Life, the death of a young man in his prime, is something that the director has first-hand experience of. His younger brother Chris, the middle child of the family, was severely burnt in the road accident that killed his wife and Biskind reported that Larry, the youngest of the three sons, suffered from serious bouts of depression and committed suicide in Spain. It’s impossible to say how these incidents have directly influenced Malick’s work since he refuses to speak to the media. Yet after five films, recurrent themes have developed in his narratives: the battle between men and women, the omnipresence of nature, a life full of spiritual questioning and protagonists frustrated in ambition. These are too prominent and close to stories of Malick’s own life to dismiss without consideration. It’s often said that directors continually remake the same film dressed up in different guises, and this is certainly applicable to Malik. Remarkably, the director does seem to be breaking one annoying habit. The good news for cineastes is that Malick has already finished shooting his next film, an as yet untitled romance starring Ben Affleck and Rachel McAdams. The project is surrounded in secrecy but with Javier Bardem and Rachel Weisz also taking part, it seems that at the age of 68, the director may just be getting into his stride.